While it may sound a bit crazy to think that doing chores or cleaning could make you happier, there have been studies showing that cleaning related activities actually give people a sense of pride and accomplishment and lead to feelings of confidence. Performing and completing cleaning tasks can eradicate guilt over a messy area and invite feelings of hope and happiness. Whether mopping, dusting or vacuuming, the act of cleaning can lead to greater happiness and a cleaner home can mean more productivity and motivation. The smell of fresh laundry and the aroma of freshly cut grass can recreate childhood memories and send us into a state of bliss. Cleaning often involves citrus scents like lemon, lime and grapefruit, these powerful scents can reduce anxiety. Cleaning chores often involve serious acts of physical exertion—be it taking a load of laundry down the stairs, scrubbing the outdoor deck or sweeping the floors, the act of doing cleaning chores makes us more active and in turn, keeps us fitter and our minds challenged with the multi-tasking and demands of various cleaning projects. Removing mess and clutter in a home, invites a sense of freedom and leaves room for invigorating pursuits. When the kitchen countertops are clean, there is room to cook, do homework or play card games. Keeping clutter to a minimum creates positive energy and life momentum. Clutter and mess can leave people feeling aimless and unhappy; a serene and spotless home or office can increase feelings of calm and cheerfulness. At All Star Cleaning in Northern Colorado, we strive to give others that feeling of the tranquility that comes with a clean environment. Our maid service professional team is trained to tackle those culprits of dirtiness like pet dander, dust and mildew. When our homes and living spaces are neat and tidy, days seem to run smoother and problems seem less burdensome. 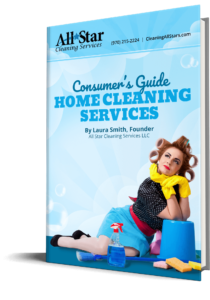 Social scientists have actually found that cleaning a house is a natural mood booster and can help people feel greater control over their lives and circumstances. Don’t have the time to devote to getting a happiness lift from cleaning? We’re here to help! Contact our housekeeping professionals at All Star Cleaning Services in Fort Collins or Loveland today.